After trying to make the manual WonderMill Junior Deluxe grain mill work for me, I decided to switch to an electric grain mill. 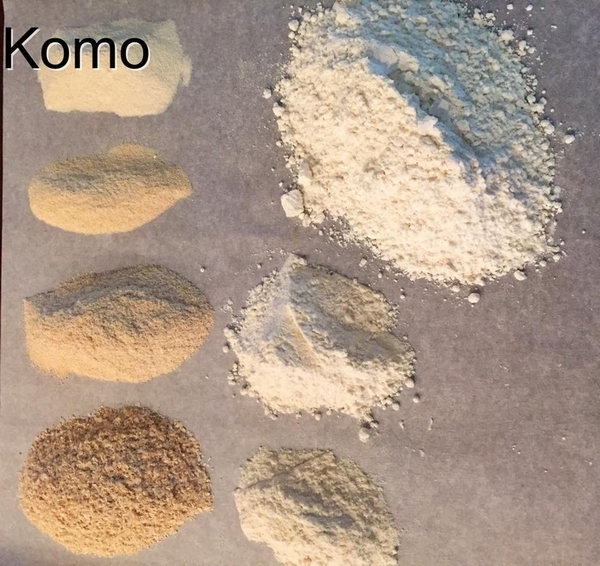 After much research I purchased the KoMo Medium Electric Grain Mill from Pleasant Hill Grain. Despite having a ton of questions and speculation after my previous grain mill experience, I’ve been in love with this mill since day one. I’ve now had it nearly 2 years. Let me tell you more! **I want to take a moment to state that I was not compensated for this review. I paid in full for my KoMo Mill. These words are all purely from my own experience. I first owned a manual mill. After trying multiple ways to use that mill I concluded that the amount of time and effort a manual mill demands just did not fit my busy lifestyle with kids. I needed a hands-free, fast mill. 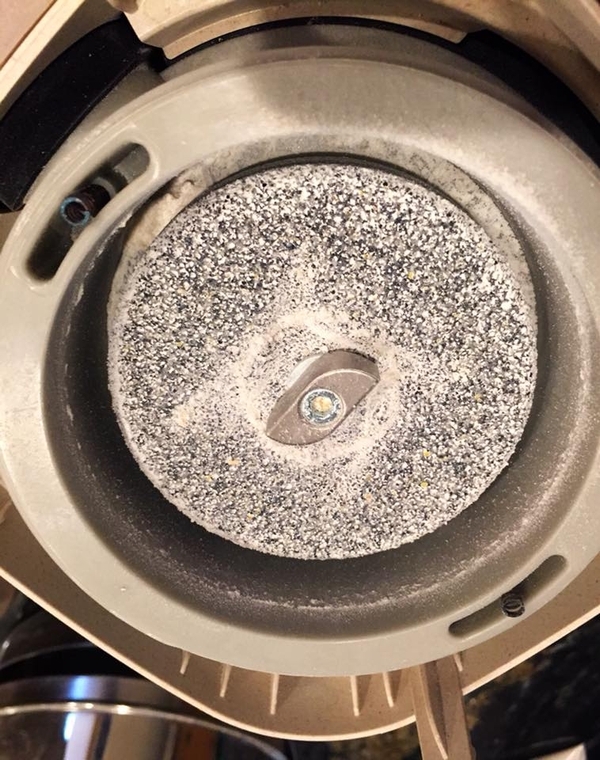 I knew in choosing electric I would be giving up the ability to grind oily seeds/nuts but I found all those could be ground with my Ninja food processor and my coffee grinder. (If you’re wondering, wheat berries cannot be ground in a food processor…I tried :). 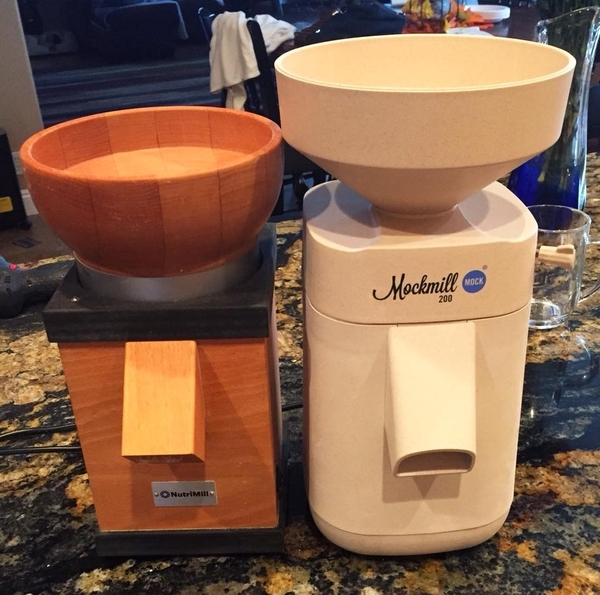 You can read a thorough account of my experience with that manual mill by checking out my other post: A Mom’s Honest Review Of The WonderMill Junior Hand Grain Mill. Durability and appearance. I didn’t want another plastic appliance for the kitchen. I’ve always felt that plastic both looks and acts cheap. However many (all?) competitive electric mills on the market have a mostly plastic exterior. 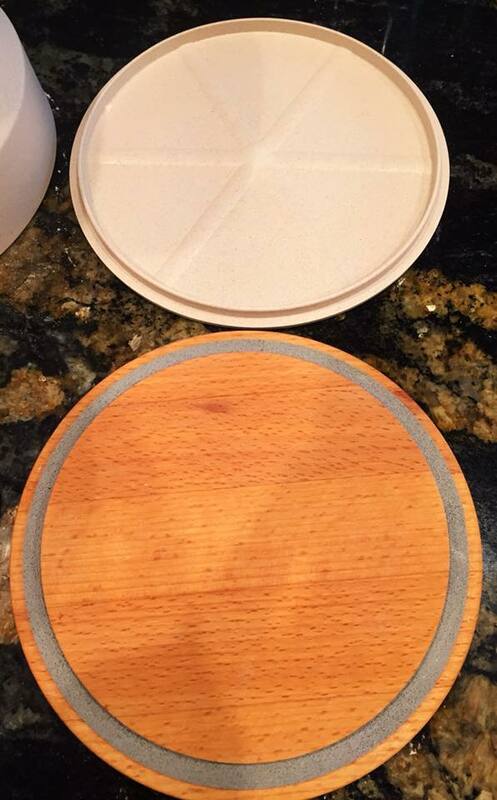 The KoMo Mill with is crafted wooden housing looks like a work of art and looks beautiful on my counter. I don’t feel the need to hide it away like all my other appliances. Then durability…well it comes with a 12 year limited warranty which I find to be an amazing testament to KoMo’s faith in their product. I love when a company makes a product that they expect to last. Ah where to begin….short answer: everything. KoMo’s 12 year warranty had me hopeful from the start. Upon arriving, the first thing I noticed was it’s heavy solid weight (about 15lbs). It stays put on my counter, no shaking, rattling, or moving (of the mill, my counter, or the contents in my cabinets underneath). The millstones are made of corundum and ceramic. To be honest, I don’t know much about materials, but the company claims this makes them more than rock hard which means minimal wear after years of use. The most I’ve ground at a time is 15lbs. I paused for a minute or two every 5 five minutes, for really no good reason. The mill was warm but kept on grinding with zero issues and no change in effort. I stopped at 15lbs because that was all I needed, not because I was worried about continuing. After two years of use I’ve yet to even scratch the hardwood exterior. 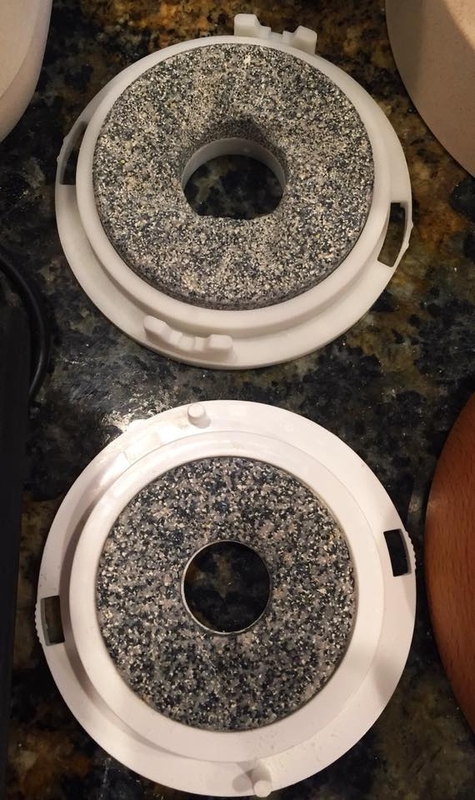 I opened it up once just for curiosity of what the millstones looked like. In short, I’ve had no issues what so ever, the quality appears to be as awesome at the company claims. I was dying to know this answer before purchase. I read so many reviews of competing companies and noise level was a hot topic. 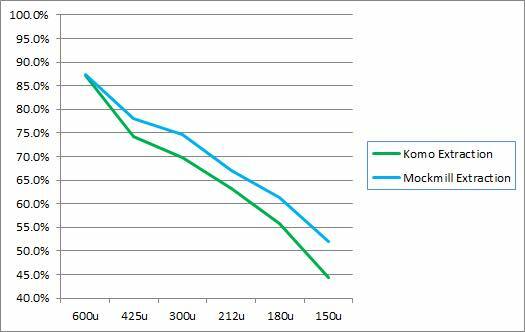 KoMo says 70dB when finely grinding hard Spelt grain but that still doesn’t give me an idea as I don’t often think of sounds in dB. So just how loud is this mill? Well first let me clarify that when you first turn the mill on, BEFORE adding grain the mill is only a quiet hum, comparable to a microwave (mill MUST be running before grain is added!! and CANNOT be shut off until all grain in hopper is ground!!). I find it tolerable to be in the same room as this mill because it doesn’t have that obnoxious high pitched shrill sound of so many tools. 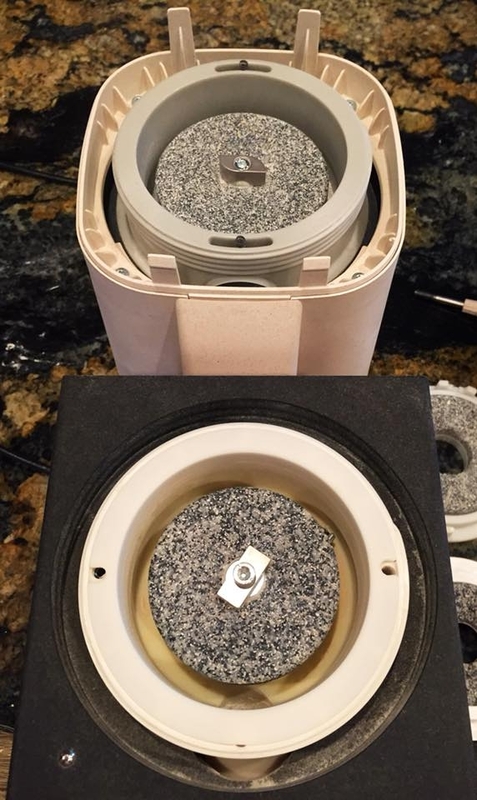 There is a noticeable difference (dulling of pitch) when grinding with the lid on versus off. Everything below is the noise with grain actively being ground. Can I hold a conversation standing next to the mill? No…You can shout a word or two and probably be heard, but it will stop all conversations in the room. Step about 6 feet away and you can talk loudly, or around the corner into another room and you can have a more normal conversation again. 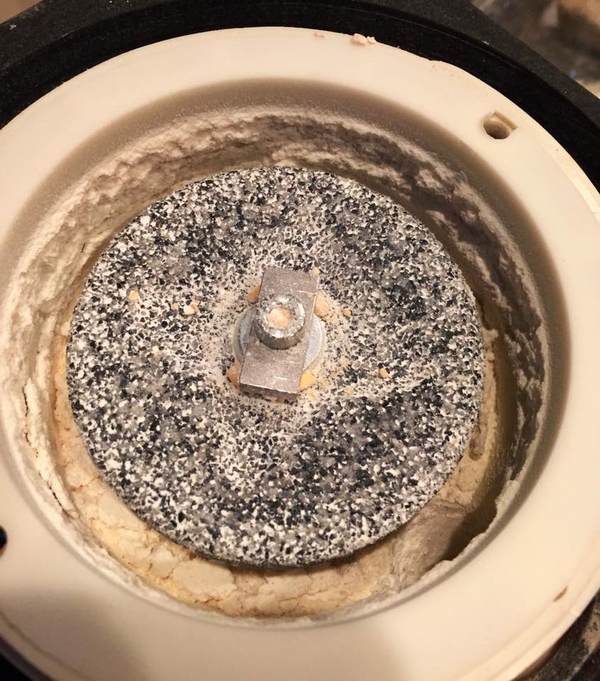 Food processor/blender? Quieter than my 1500 watt Ninja food processor/blender because it does not have the same obnoxious “shrillness” or electric motor “whine”. I find the KoMo mill much easier on my ears than my Ninja. If I’m using the Ninja for more than a few minutes, I put it in another room and shut the door. When I turn on the Ninja my kids cover their ears. With the KoMo they ask if I’m done but there’s no distress. The KoMo is still very loud, but I can be in the same room as it the whole time I’m grinding 10lbs of grain. Weed Eater? Quieter than a gas one but louder than an electric one…and certainly a low grinding sound and not the high pitch whine. 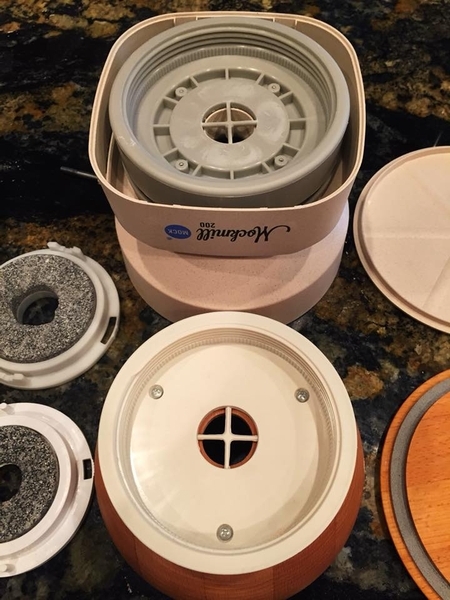 WonderMill Junior Deluxe Manual Grain Mill? (what I owned before) Much louder (but minus the whole counter and all cabinet contents rattling). Consistency? 100% absolutely! It’s all the same, no mix of a few bigger pieces. Whatever you set it at is what you get. If I grind a lot at one time, I will feel the flour after 5 lbs and might rotate the hopper one click finer before continuing. To me there is a slight increase in grain size as the stones warm up, but it’s all the flour, not sporadic bits like the manual mill I had. I like that I can grind fine for baked items and then a few clicks coarser for breads. Then I can easily rotate the hopper to very coarse and slightly crush my oat groats for steel cut oats. I love being able to easily make small and large adjustments to the coarseness as I grind. Since the hopper moves with audible and easily felt “clicks” you can also remember what settings you like. The only commercial flour I have bought since owning the KoMo Mill is self-rising flour (for these amazing 2-ingredient biscuits that are a must for holidays and rival those buttery KFC/Popeye’s buicuits!). 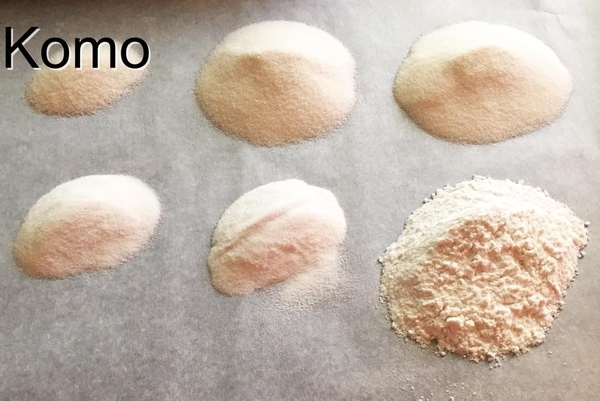 Yes using fresh ground flour for all your baking needs from cookies to breads, does come with a learning curve and a difference in taste. That’s to be expected though, when going from compact, flavorless commercial flour, to fluffy nutrient filled fresh ground flour. So for me the positives far outweigh my frustration when a recipe doesn’t come out as I thought. As I wanted, the KoMo Mill is fast and hands off. Once the wheat is poured into the hopper I only need to occasionally rotate the bowl catching the flour as it fills up. I can pour 2 lbs of wheat berries into the hopper and wait a few seconds before its low enough to set the lid on. 1lb hard red spring wheat berries took 2 minutes and 30 seconds to finely grind. 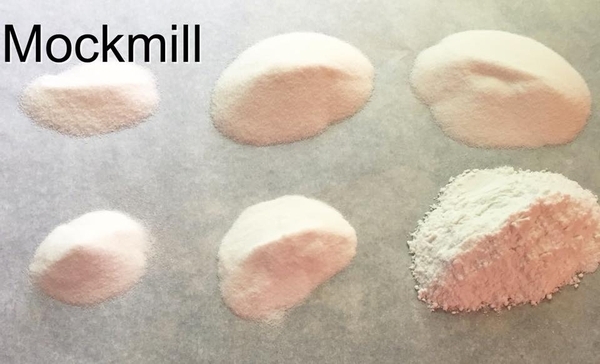 There is no cloud of flour coating my kitchen either like I read in many reviews of other electric mills. I might notice a fine dust on the hood of my oven, but there’s no need to wipe down even the entire counter the mill is on. The mill grinds very efficiently and with little/no waste. One cup wheat berries finely ground, measured 14oz flour immediately after. By the next day this settled to 12oz. (With the manual mill I had, 1cup wheat berries = 10oz ground flour). I simply plug in, grind, un-plug. No clean up, no taking apart, super-duper easy. The only thing that stops me from using the mill at any point in any day is the noise (sleeping kids, holding a conversation, etc) but that would be the same case with a manual mill (in addition to physical labor). The KoMo Mill was intentionally designed to not need additional accessories and add-ons to operate. If you’ve read my review of my previous manual mill, then you know I bought additional accessories to try and make grinding easier. From day one with the KoMo Mill I have been able to plug in and go, I’ve never had to even think about buying something else for it. What else can it grind? Alright, alright, if I HAVE to stretch and find a dislike it would be that I can’t grind popcorn in the mill for cornmeal. Popcorn is too hard and will void your warranty, so I don’t dare try! 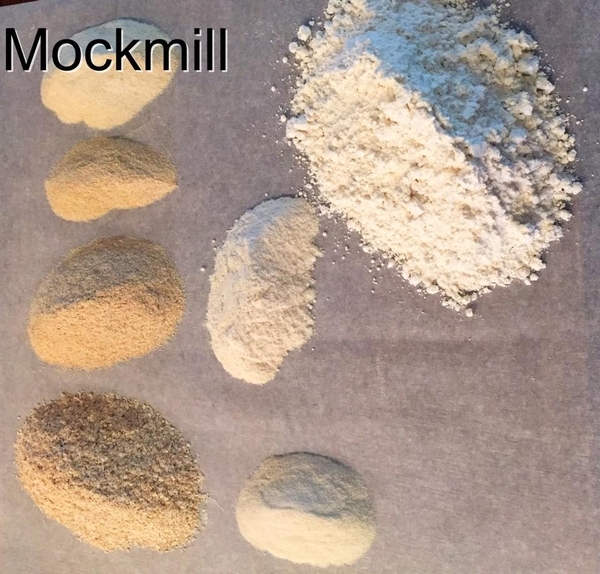 I knew this fact before I bought the mill and it didn’t deter me, and it would not stop me from recommending this mill to others. I was also unsuccessful at grinding popcorn in my manual mill. I paid $460 for my KoMo Medium Electric Grain Mill when I bought it from Pleasant Hill Grains about 2 years ago. I’ve never regretted the purchase. The price tag felt like a lot, and was double that of my previous manual mill, but the ease of use and quality of ground flour, makes me feel that my money was well spent. I’m confident that this mill will last a long time. Should there be an issue, I have faith that as a company that takes such pride in their product, they would also stand by their product. 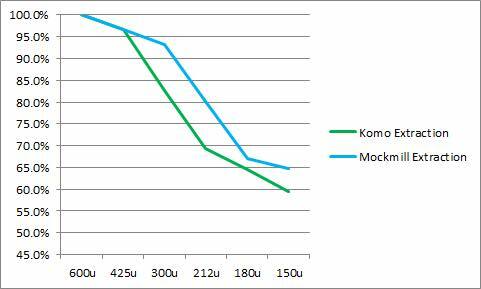 If you’re looking for an electric grain mill then I would highly recommend that you look into the KoMo Mill line. Pleasant Hill Grains was an easy and informative distributing company to work with, I see no reason why I wouldn’t reach out to them again if I had another purchase.